Exhibit Hall open 9 a.m. to 5 p.m., seven days a week. Gardens open at 8 a.m.
$13 regular; $10 students, seniors age 62 and up, and active military; $3 children ages 5 to 12; free to members and children under 5. Admission fee includes entry into the gardens. 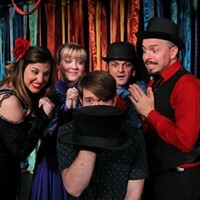 Free admission for all to restaurant and gift shop. But she was also struck by its geometries and colors. In an artwork inspired by the mine, she focused on the colored spirals winding their way down the pit walls. And she included a delicate pool of water at the bottom, reflecting the cerulean blue of the sky above. 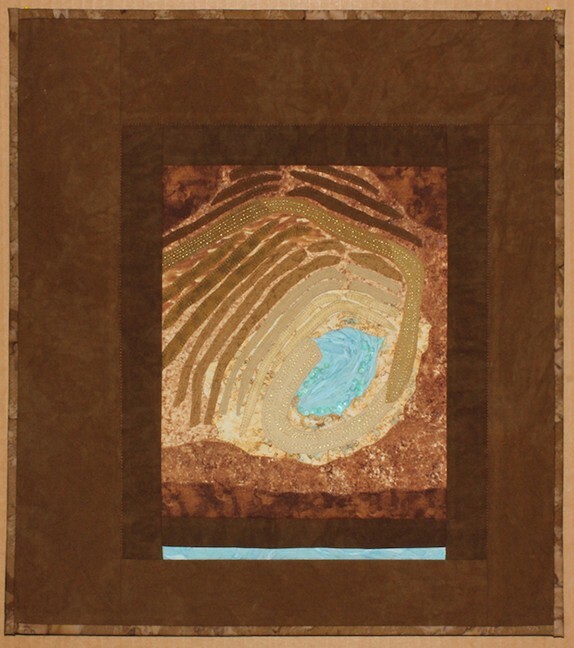 Her piece, "Seen from Above: Open Pit Mine, Sahuarita, AZ.," is a delightful work in cloth, all coppery and turquoise. Stitched strips of fabric stand in for those geological layers spiraling downward and pale scraps glisten at the bottom of the pit. It's one of many pieces in the exhibition Copper State at Tohono Chul that focus on the terrible beauty of Arizona's mines. Viewed from on high, these scars in the landscape can look like "abstract paintings thrown to the earth," as another exhibition artist, William Lesch, puts it in his artist statement. 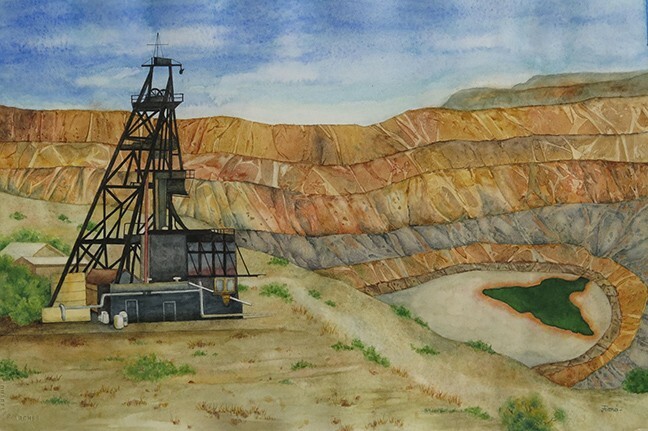 Fiona Lovelock, in the lovely watercolor "Bisbee Copper Mine Shaft," also emphasizes the spiraling stripes of a pit mine. She's painted the Bisbee version rusty copper and earth green. But Lovelock also includes the ugly black shaft that once brought miners deep into the earth to do the dangerous work of breaking rocks underground. And the pool of water at the bottom of her pit is a sickly polluted green. Some works in the show simply celebrate the brightness of finished copper. Michael Afsa's "Copper Blooms" is a shimmering 3-D wall work that transforms petal-shaped slices of copper into radiant flowers. Joan Baron and Ali Mariles fired up the kiln to make "Rocks," a clay and copper piece that replicates the metal in its raw, unmined state. And Judy Carpenter's two abstracted landscapes give the Arizona sky an alluring copper glow. But most of the exhibition's 35 artists wrestle with the problematic legacy of mining in Arizona. Curator James Schaub notes that copper mining began in the state in the 19th century, and even today produces about 60 percent of U.S. copper. That copper is used in wiring and machines—including computers—that all of us use. But mining—especially open-pit mining—wreaks terrible, permanent damage, leaving contaminants in the soil and gaping holes in the land. 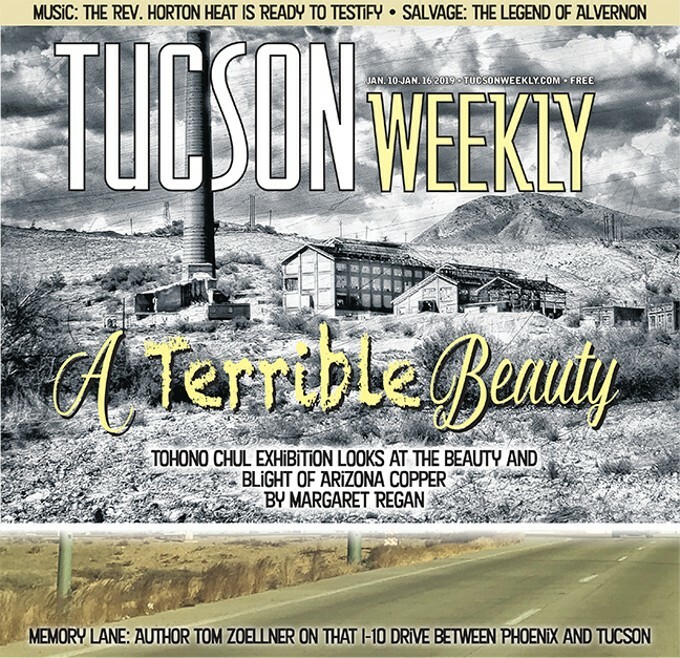 Just take a trip to Bisbee or Clifton-Morenci to see the massive gashes cut into the earth. Mining gulps up huge amounts of water badly needed in arid Arizona. And the historically ill treatment of miners, from the Bisbee Deportation of 1917 to Phelps Dodge's merciless response to the strikes of the 1980s, still haunts the state. The threat of a new copper mine, the proposed Rosemont Mine in the Santa Ritas, makes this show particularly timely. The short-term mine would leave behind a permanent pit—a mile wide and half a mile deep—in one of Southern Arizona's most beautiful regions, endangering wildlife, forests and the water supply. The discarded tailings would remain a blight forever. While the artists don't specifically cite the possible Rosemont debacle, many of their works target the damage that mines do. Photographer Lesch confronts the mines' sins in three important works. Like Annie Gordon, he looks at the pits from on high, but he goes even higher, flying above them in a plane piloted by his son. He sees the sprawling damage below as "road maps of our way of life," visual testaments to our collective assent to trade environmental health for cool computers. Lesch's mixed-media pieces start with a photograph, but he prints them on the shimmery copper produced by the mines, and layers on gesso and paint to deliver color and texture. His gorgeous "Blue Pool #27, Sahuarita Mine Tailing Pile" is a wonderland of cracks in the earth far below, of snaking lines and seeping liquids spreading out over the land. His colors are beautiful and dangerous: chemical oranges and over-bright artificial greens alien to the desert. Curt Pradelt, in a series of three small photos cleverly printed on shiny copper leaf, poetically documents the tailings marring the abandoned mining town of Ruby. The waste from the old mine is piled up like a sand dune, he writes. Seen from Above: Open Pit Mine, Sahuarita, AZ,” fabric, sequins and thread by Annie Gordon. His "River of Tailings, Ruby, Arizona" is a long shot of the mine debris covering the desert, the glimmer of the copper shining through the waste. In another image, barbed wire blows like a tumbleweed in front of a ghostly old miners' shack. Pradelt's lovely works are a reminder that mines are fleeting, but their damage continues into infinity. Patrick Hynes goes metaphorical in his witty "Open Pit Viper." This wall work of painted wood features a dangerous snake curling its way out of the pit, ready to strike. Mimicking the snake in the Garden of Eden, this snake carries a nugget of temptation. But instead of a lush apple, it's a tiny but shiny bit of copper. Several artists offer welcome history lessons. Laurie McKenna, who recently got national attention in the movie documentary Bisbee '17, exhibits a small piece of her multi-dimensional art installation about the infamous Bisbee Deportation. Using a penny "mash machine," she converted actual U.S. copper pennies into commemorative medals, one for each of the 1,200 striking copper miners who were run out of town on trains and deposited in the remote New Mexico desert. Among the four pennies on view is one lauding Rosa McKay, a state legislator representing Cochise who vocally opposed the kidnappings and was likewise threatened and exiled. Another honors the Flores Magon brothers, a pair of Mexican labor activists who challenged the discrimination the early mines meted out to Mexican mine workers, who were paid far less than whites. Photographer Dan Chavez is showing two excellent photo prints of early mining structures in Arizona. Meticulously composed, these images of retired copper smelters in Superior (built 1880) and Hayden (1910) remind us of how industrialized the Wild West really was. Chavez captures the puffy white clouds drifting over these smelters today. When they were working, though, their stacks were busy belting out black smoke. Chavez notes that the historic Superior smelter is scheduled for demolition. That's a pity. Far better to preserve such structures as a reminder that while mines contributed to the economy, they sickened the workers and their families and permanently despoiled the land.